I’m working on a couple of printed kits for the Flying Pig website. Initially I’m making the Flexiphant and the Dog’s Dinner model. Check out Instagram to see them both in animated form! I’ve completed the parts page layouts (Sample further down this page) I’ve also completed the assembly photography for both models and made a start on the cover artwork for the Flexiphant. The picture of the booklet at the bottom left of the cover is from another model, it is there as a place holder for now. I’ll need to complete the instructions so that I can mock up a kit to photograph for the final layout. Looking good so far! 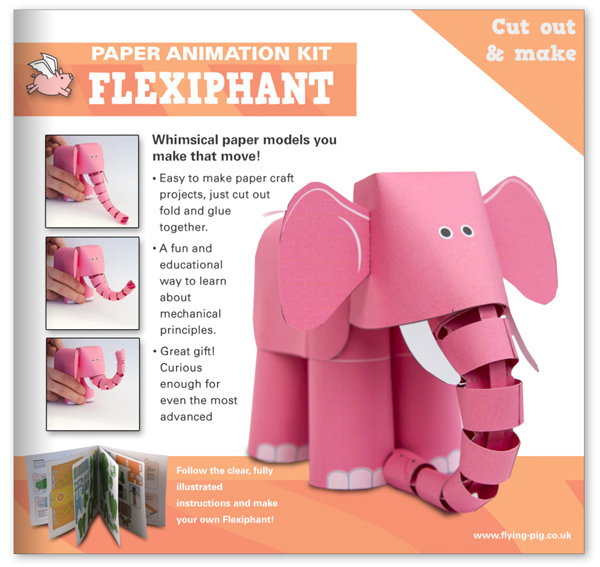 Sample of the parts pages for the Flexiphant model. This will be a fun little project to put together. it's simple and yet the movement is pleasing to the eye. A lot of times children become frustrated and discouraged if the project doesn't work out the first time. In other words, they have a bad first experience. Perhaps, this would provide a good first experience to encourage those new to new to Flying Pig family to build your more complex kits in the future. Thanks John! I've made this model on courses a couple of times – it has always been very popular.